Find out all you need to know about our Keyword Difficulty score. KD stands for "Keyword Difficulty" and represents an estimation of how hard it would be to rank on the 1st page of Google (aka the Top 10 search results) for a given keyword. KD is measured on a scale from 0 to 100, with the latter being the hardest to rank for. KD is calculated using our own unique algorithm, and is based on the number of referring domains (RDs) the Top 10 ranking pages (organic search results only) for a given keyword have. Note: KD does not take into consideration any "on-page SEO" factors. How accurate is the Keyword Difficulty score? 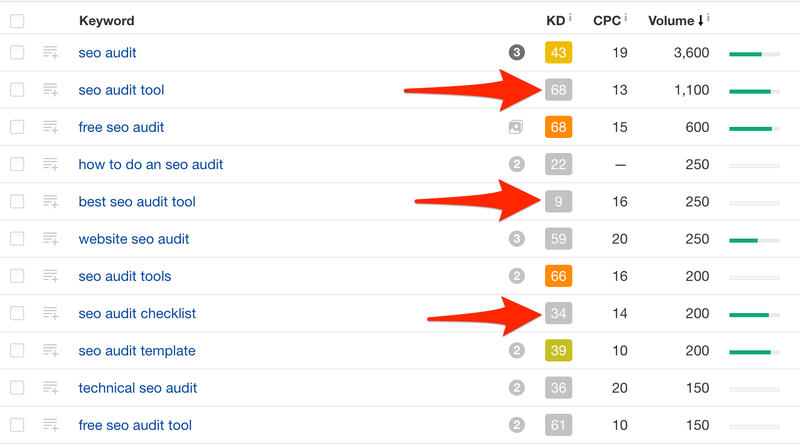 Given that Ahrefs has the world's best database of live backlinks, the KD score represents the most accurate picture of how competitive a SERP is backlinks-wise. But even though Ahrefs is more accurate than any other tool, we do not recommend you base all your SEO decisions on our KD score alone. Think of it as a "first filter" - you can use it to remove keywords are too competitive, or as a way to prioritize keywords to target. Why are some of the KDs in my report gray? These are actually cached KD scores. We regularly process SERPs for millions of keywords and calculate the KD score based on the pages we see ranking there at that time. Some keywords are regularly updated; some aren't. We show them in grey to illustrate that they are not the most up-to-date. Pro-Tip: These cached KDs may not be the most accurate, but they are extremely handy when you need to filter a large list with thousands of keywords. Note: The number of times you can refresh a keyword depends on the number of metrics credits you have. What is the 'metric credits' in Keywords Explorer, and is it a monthly limit? How accurate is the keyword search volume in Ahrefs?